What does a traffic barrier look like? Well, that all depends. Traffic barriers are available in a variety of dimensions, from the compact to the very large. Of this latter type, K rail is the undisputed king. This is the most massive of all traffic control barricades – essentially a wall standing between restricted areas and traffic or pedestrian flow. 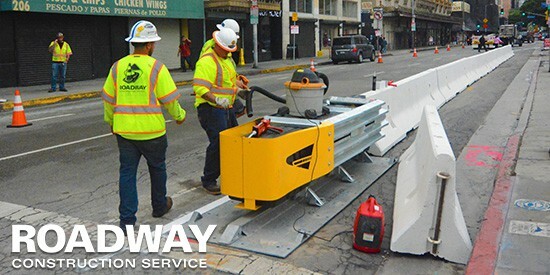 At Roadway Construction Service, we’ve given the deployment of K rail (a.k.a. Jersey barrier) the highest of high priorities. We understand that this massive wall often is all that stands between smooth, safe traffic flow and serious mishaps. Consequently, we’ve directed abundant resources to the development of reliable K rail deployment strategies. This is yet another example of our commitment to maximizing roadway safety. Variety characterizes the K rail traffic barrier. Let’s start with portability. This convenience is provided by the water-filled Jersey barrier. Made of a plastic outer casing, this type of K rail is easy to carry, transport, and set up. This acclaimed ease of handling and portability makes them particularly valuable in emergency situations. A water-filled Jersey barrier consists of hollow plastic modules, which may be interlocked to form a wall of any desire length. Once set up, each segment is filled with water to provide strength and resilience for a wide variety of jobs. The possible jobs include everything from maintaining crowd control at public events to providing traffic control in construction zones. Clearly, when a situation calls for quick deployment of a temporary traffic control barrier, nothing surpasses the water-filled Jersey barrier. Conventional, concrete K rail, on the other hand, is the barrier of choice for long-term or large projects. For sheer strength, these traffic control barricades stand unrivaled. As with its water-filled counterpart, the concrete variety is available as modules that can be connected to form a wall. The major difference, of course, is that these modules are made of solid cement. Manual lifts are out of the question. Generally, a forklift is used to set these massive blocks into place. Most often, the concrete Jersey barrier is used to separate highway lanes during long-duration construction projects. If you’ve ever traveled a freeway when lane-widening is taking place, you’ve seen these protective walls in action. They’re a very common site in Southern California. While road traffic control and safety are the primary objectives of concrete K rail, there is another side to their usage. More and more, aesthetic considerations are being factored into their deployment. For example, these traffic barriers are now available in striking geometric shapes that lend visual appeal to their functional brawn. Would you like to learn more about the deployment of K rail for road traffic control? Reach out to Roadway Construction Service any time. We’ll be happy to provide additional information and answers to all your questions.